“We had such a fabulous time, Luke. We smiled so much and made so many new happy memories. Special thanks to you for creating such an amazing charity.” When THHN receives feedback like that, we know that what we’re doing is worth it. These words came from one of the families we welcomed to Torbay in May, which was a manic month for our charity. Not only did we offer free memory-making holidays, taking the total number of people THHN has welcomed way beyond 400 in the past year, but the fundraising and volunteer activity has been incredible too. Thank you to everyone. THHN is honoured and delighted to have been selected as one of two charities the Chairman of Torbay Councils will support in 2016. 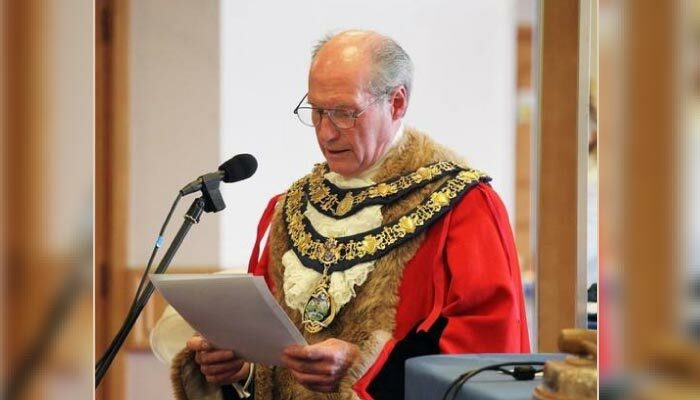 On 11 May Councillor Raymond Hill was voted in for an unprecedented second term of office at a civic ceremony, where he made the announcement in front of guests who included THHN’s founder Luke Tillen. Congratulations to Councillor Hill; we are very much looking forward to working with him and his colleagues over the coming year. We reported last month on the fantastic Hair Torquay event organised by Tom Chapman. We can now reveal that it raised an amazing £1,120 for THHN. A huge thank you to Tom and to everyone else involved in the show..
Last month Annemarie, Carolanne, Paul and Helen gave up a sun-drenched weekend to give our Memory Maker caravan at Finlake Holiday Park in Chudleigh a spring clean. They did an epic job – thank you. Meanwhile, Andrew Medworth of Medworth Plumbing and Heating Ltd in Torquay carried out all the gas safety testing at the caravan for free. We are massively grateful to him. But May was also the month we said goodbye to Artur, our fantastic caravan caretaker Artur. Sadly, for personal reasons he was no longer able to fulfil the role. The whole team at THHN would like to say a heartfelt thank you for all his hard work over the last three years and wish him the very best for the future. Save the date – Sunday, 24 July. 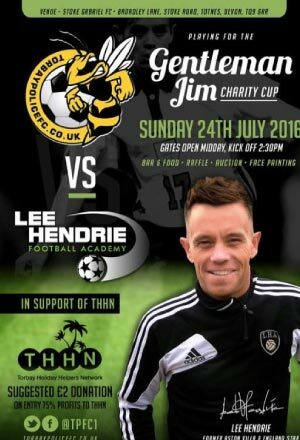 This is when Torbay Police FC play Lee Hendrie Academy for the Gentleman Jim Charity Cup at Stoke Gabriel Football Club, while raising funds for THHN at the same time. Kick-off 2.30pm. Don’t miss this fantastic football event. The Provincial Grand Lodge of Devonshire invited THHN founder Luke Tillen to a special event at Mt Edgecumbe Masonic Hall in Plymouth to receive a cheque for £750 made out to THHN. This was part of an incredible £25,000 from the Masons WAKE Fund given away to 25 charities and voluntary organisations. THHN was nominated by the Courtland Lodge in Paignton and Luke was accompanied to the event by Courtland Lodge’s Mike Locke and Mark Bowes-Cavanagh. We would like to say a huge heartfelt thank you to all the Masons for their wonderful donation and hospitality. THHN founder Luke Tillen was guest speaker at the Dawlish Housewives Club, which made a greatly appreciated donation of £70 to the charity. Luke Tillen spoke passionately about THHN at a charity golf day held by Linden Homes at Torquay Golf Club. THHN was one of the two charities nominated as the beneficiaries of this amazing event..
Flow Studio offered free Strala yoga classes in return for a donation to THHN, giving people the opportunity to try something new and raise money at the same time. What’s not to love? Thank you so much. A big thank you to Day Lewis Pharmacy on Bronshill Road, Torquay, who raised funds for THHN during May. Fancy helping out in THHN’s Memory Maker shop in St Marychurch Precinct, Torquay? If so, please call 01803 324542 or email carolanne@thhn.co.uk. Any amount of time given – even just an hour a week – is hugely valued and makes an enormous difference! Or maybe you like the idea of marshalling at the Torbay Half Marathon on Sunday, 26 June, when the organisers will be making a generous donation to THHN for the marshalls we supply. This is a great way to watch an amazing event, cheer on the Team THHN Runners and raise some money for THHN all at the same time. You would be needed from around 8am until midday. Please email brian@thhn.co.uk. Have you entered the Memory Maker Mile Fun Run yet? This fantastic race is open to all ages and takes place on the morning of the Torbay Half Marathon on Sunday, 26 June, on closed roads around Paignton Green. All participants get a fantastic medal Entry just £5 – just by entering you will be helping THHN. You can enter online at www.thhn.co.uk/funrun or on the day before 9am at the THHN gazebo on Paignton Green. THHN’s amazing City to Sea marathon and ultramarathon on Saturday, 3 September is already more than half full, with more runners and walkers signed up than for last year’s inaugural event. It’s not too late to enter, so if you’re interested in running an ultra or marathon, or walking a marathon, go www.cts53.co.uk. May has been a particularly busy month for THHN, welcoming lots of families in desperate need of a break. Families stayed at Hotel De La Mer, Babbacombe; THHN’s own Memory Maker caravan at Finlake Holiday Park, Chudleigh; the Marine Hotel, Paignton; our new supporters the Clifton Hotel, Paignton; Glendower B&B in Torquay; and another new supporter The Outlook Holiday Flats in Paignton. As ever, we are incredibly grateful to all the businesses and organisations that help make these precious getaways a holiday to remember, including: Teddy Mountain UK, Westcountry Fruit Sales, Daisy Cakes, Halletts the Bakers, Claire’s Cakes, Luscombes Butchers of Torbay, D&H Fisheries, Riverford and Project Linus UK.